Since switching back to Cygnar, I’ve decided to focus a bit more heavily on both tournament play, and on getting better with strong warcasters that I happen to be weak with. This primarily translates to “Haley”, since I’m quite poor with both of her iterations (I have a 40% win rate with pHaley, and closer to 15% with eHaley!). However, it rarely makes any sense to bring both Haleys as a list pairing (I suppose an argument could be made for it… but not by me), and so I need a heavy hitter to crack ARM and deal with Factions that laugh in the face of Haley’s “No Charge/Run/Trample” bubble. In my opinion, that narrows the field to the following: Siege, Stryker, and Darius. Now, that’s not to say the other Cygnar warcasters aren’t good! Far from it. But to pair with Haley, you have to compensate for her shortcomings, and really, only those 5 warcasters (including all 3 Strykers, obviously) do so. Recently, the most common pairing has been Siege, and with good reason… he’s a fantastic Hordes-drop, he cracks ARM like nobody else, and he himself is tanky and a tough nut to crack. Okay, so there are some things I got right in this list: Including Reinholdt is very, very good. The Defender and Avenger are both solid warjacks in a Siege list: the Avenger’s Knockdown shot can make the difference between a 50/50 assassination run and a 99/01 run. The Rangers are incredible with Siege (and Ground Pounder, which ignores everything besides Cover), and the ATGM are a great utility unit in general and give some potent infantry-clearing and warbeast/warjack pushing capabilities. Putting the Avenger with the ATGM versus putting it with Siege is really a win/win… with Siege you can usually spare the 1 or 2 Focus it’ll need to operate at peak efficiency, with the ATGM it gets Rune Shot for a critical extra 4” of range (and a potential Crit: Brutal shot if you’re aiming at something slow or Knocked Down). Let’s talk about the things *wrong* with the list: the Strider is an interesting inclusion (those 2 POW15 shots are great! ), but it doesn’t *really* want to be with Siege due to some skornergy with the Feat (you can’t choose to have the lightning chain to additional targets, so you very well might lose a great shot to a lousy POW10). If it was optional, it’s a solid inclusion… but in this list I can drop the Defender and the Strider to upgrade to a Stormwall, and that’s definitely a better choice. Also, the Stormblades are great, but Siege doesn’t help them in absolutely any way (aside from potentially Foxhole in a pinch), and they struggle without some means to get Pathfinder. Lastly, pEiryss… since this list is designed to pair with Haley and therefore primarily be a Hordes-drop… pEiryss is just shy of useless. eEiryss would be a little better (to shoot off upkeeps and animi), but all things considered, I’d probably be better off with a Journeywoman… or Jakes. Drop the Avenger, take Jakes with a Hunter or Charger… now you’re cooking with propane! Yeah, ARM24 WoldWatchers wouldn’t be such a big deal against Siege if it weren’t for the fact that they’re STILL ARM16 on Feat Turn! Damn… that is some damn sturdy Wolding… anyway, a solid list, and nothing really wrong with it. Front line of Watchers backed by healing Shifting Stones with some ridiculous threat ranges… it lacks for hitting power overall (capping out at POW18 on Megalith, I believe), but it’s designed to brick up and outlast your opponent, not necessarily kill them. With “Roots of the Earth” preventing all Telekinesis/Feat/Slam/Throw/whatever nonsense, it’s also a solid scenario presence… you’re probably not going to WIN on Scenario, sure, but you’re almost guaranteed not to LOSE on it either! Lastly, we rolled for Initiative, which I won, and elected to go first. 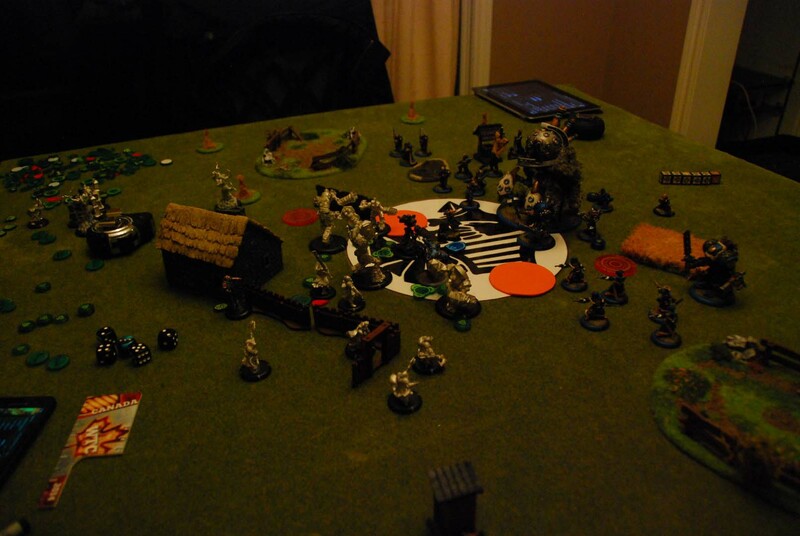 Todd picked the side of the table to deny Siege the handy fence (wise), and we were off. My Strider dropped into the middle of my zone, with the Stormblades to its right and Siege and both warjacks to the left. The ATGM went further left. 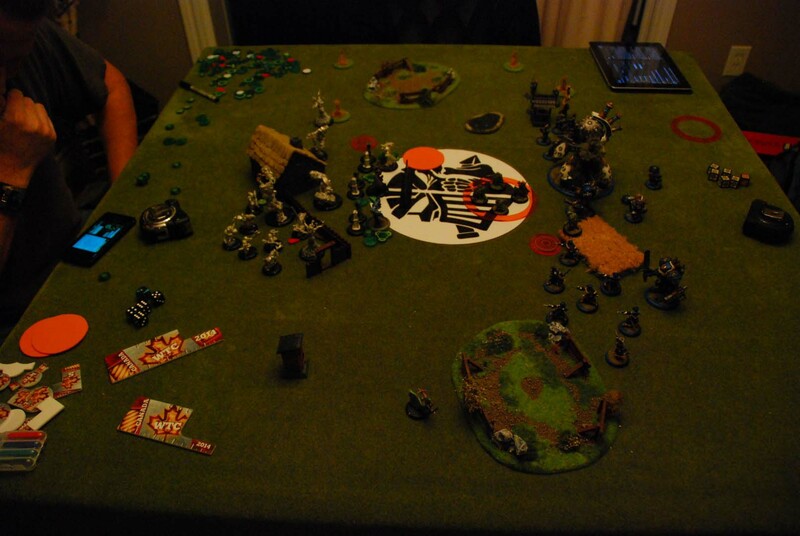 The Rangers eventually Advanced Deployed in the middle of the table, with pEiryss on the far left flank (since she’s basically useless this game, her only job is to stay further than 5″ away from my own warjacks all game!). 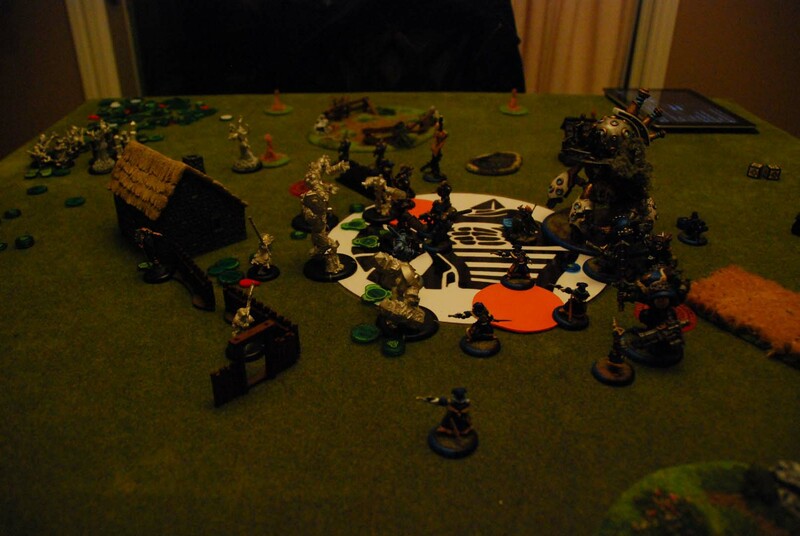 As for Todd, the Guardian, Warden, and Megalith went in the middle of the table with Baldur himself and the Druids, while the Watchers and Shifting Stones went evenly spread in the middle. One Gallows Grove went on either flank, and we were ready! Rangers run forward, 4 in the middle, 1 in the cornfield, 1 as far forward as possible. Stormblades run forward and spread out a little. ATGM run forward on the left, spreading out. They… are not going to be very useful this game. Avenger runs up behind his ATGM. 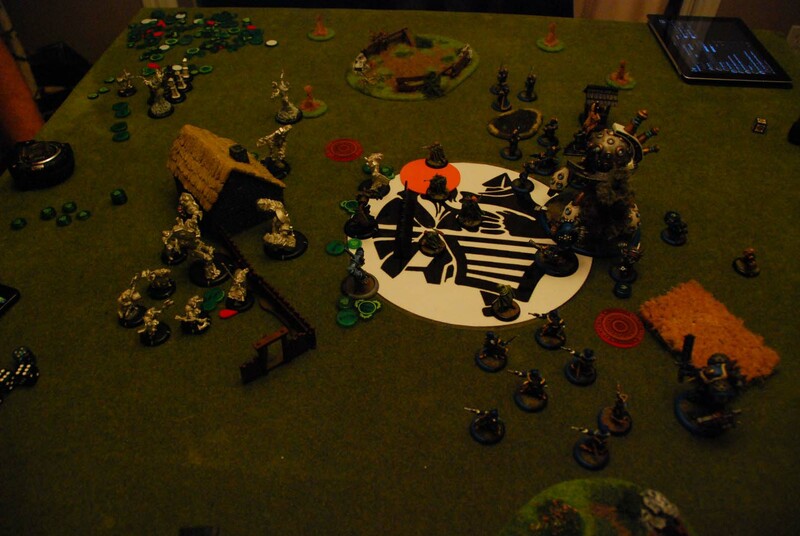 Siege moves forward, drops a Foxhole on top of my clump of 4 Rangers (DEF20 now, thank you). Reinholdt and Squire follow along obediently. Eiryss (also mostly useless this fight… stupid Fury!) runs forward down left flank. Woldwatchers all activate, move forward, and shoot Rangers. 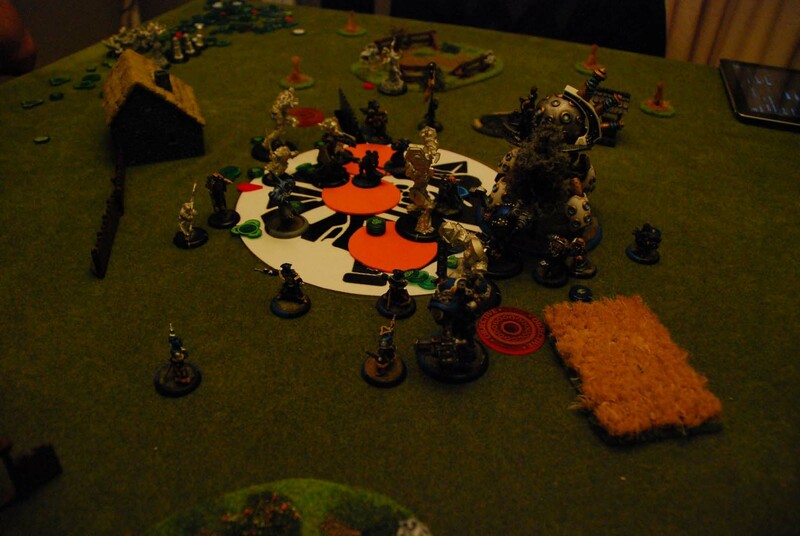 1 hits and turns Ranger into “Temporary Cygnar-Forest 1”. 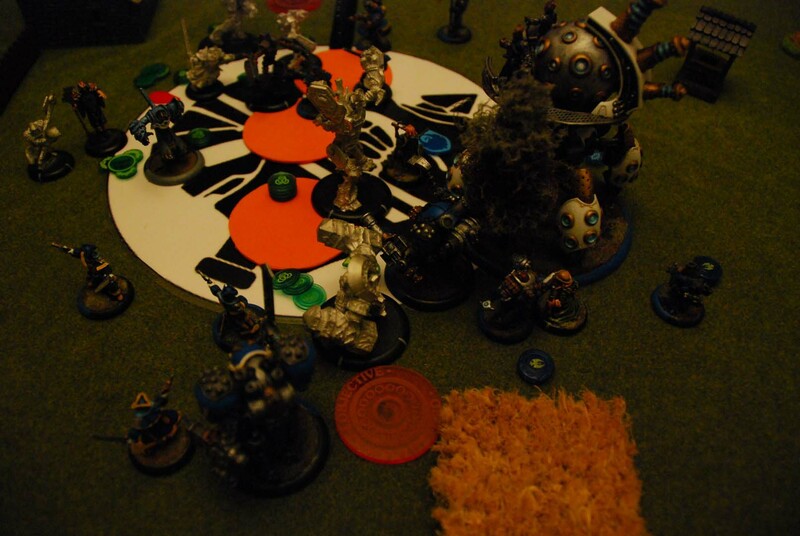 All Woldwatchers pump up to ARM24 and immobile (with some help from Woldwarden and Megalith, I believe). Shifting Stones (both units) teleport up in a line behind Woldwatchers, 2 per Watcher. Megalith moves forward. Guardian moves forward. Druids walk forward, spread out a little, use Antimagic. Gallows Groves teleport themselves forward. 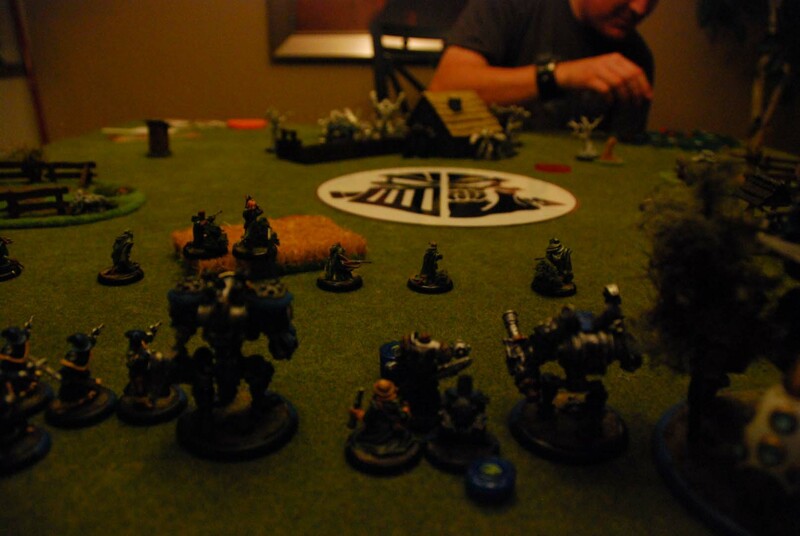 Baldur moves up, spends entire stack buffing units. 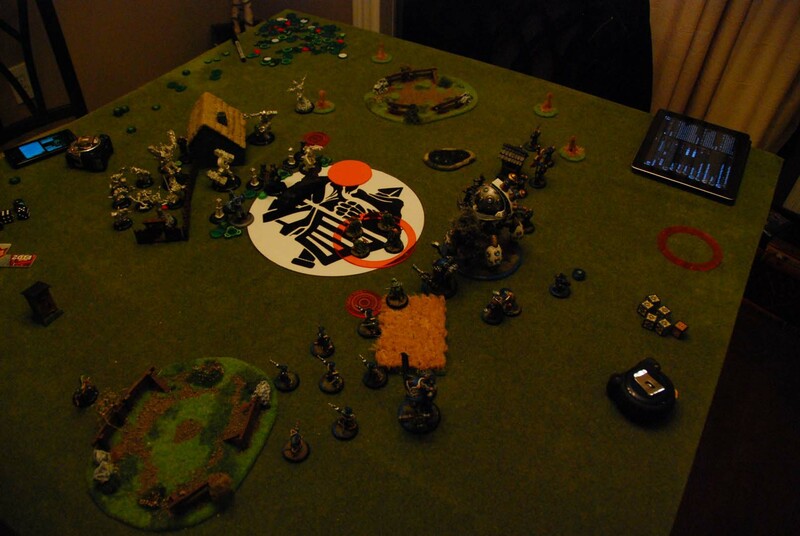 Try to estimate if Baldur is within 19″ of Siege (walk, pop Feat, hit Baldur really, REALLY hard, win). Best estimate puts him about 19.5″ away, so I decide against it. Siege drops Foxhole, gives 1 to Defender, camps remainder. Forget to take 1 from the Squire, because derp. 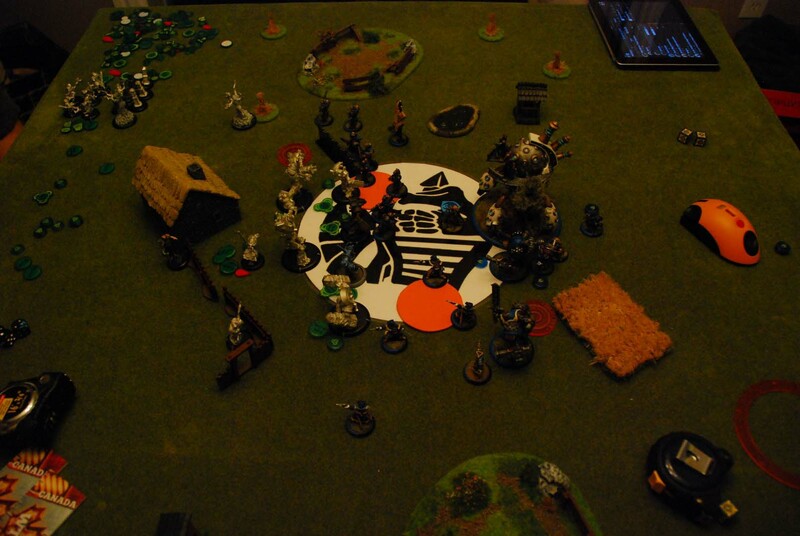 Rangers go next… figure losing their POW11s on Feat Turn isn’t so bad, more important to get their Accuracy Buff out. A couple move into the forest that was once their squadmate (didn’t realize the forests disappear… I thought they were permanent! Nope). 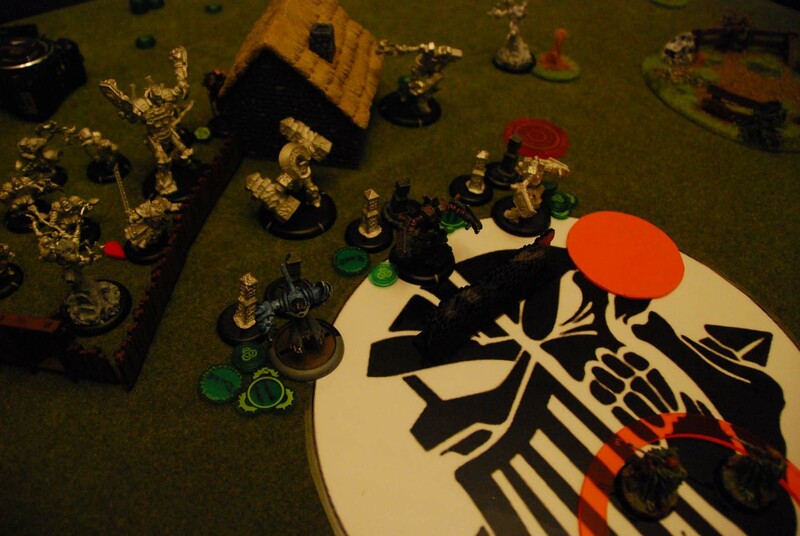 They open fire on a Stealth Shifting Stone within 5″… hit, but need boxcars to kill it. Due to spacing derps, Defender needs to activate next. Walks forward, takes shot at Guardian: misses. Siege moves up, pops Feat. Drops “Ground Pounder” on 2 Watchers (now ARM16) and remaining 4 Stones. Wipes out all the Stones (Todd still has the Stone Keeper, but that’s it), inflict moderate damage on both Woldwatchers. 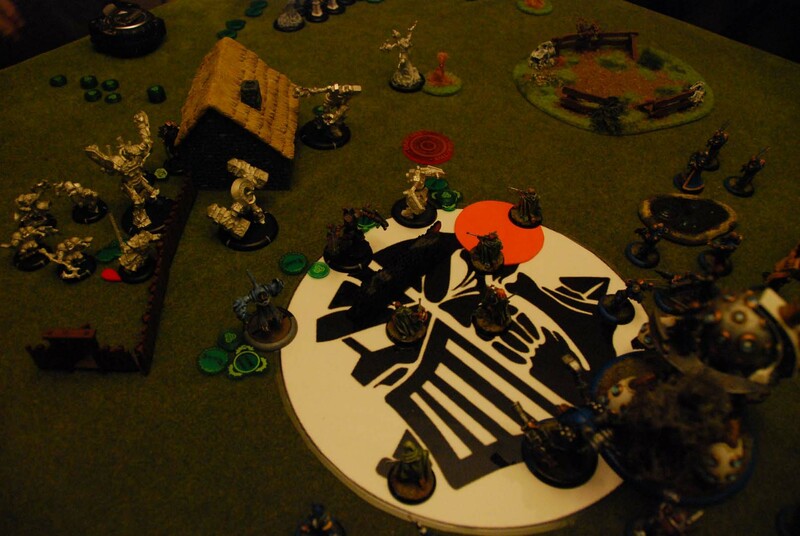 Strider moves up, blocking LoS to Siege from the right side of the table. Pings undamaged Woldwatcher for moderate damage: Electroleaps do nothing. Second shot also does nothing (dice-9). Stormblades run forward, spreading out around shallow water. 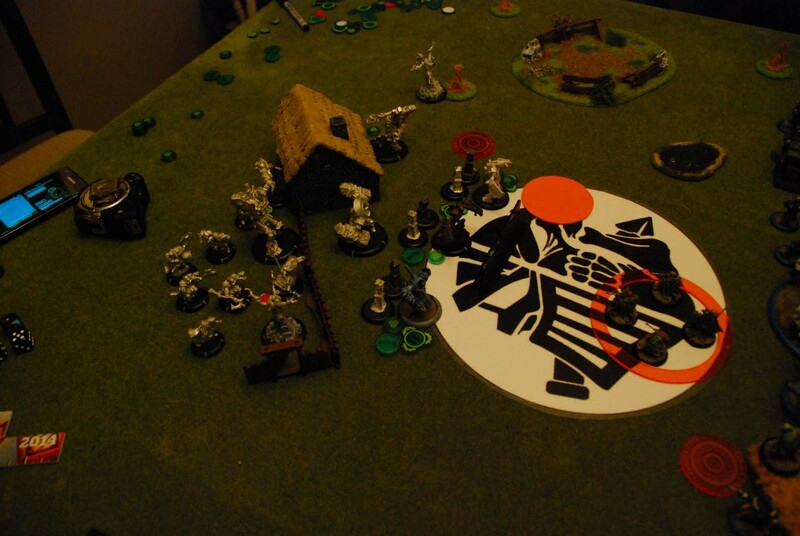 ATGM move up, fire Crit: Brutal shots at Gallows Grove on the left: Manage to kill it. All other shots ping off closest Woldwatcher harmlessly. 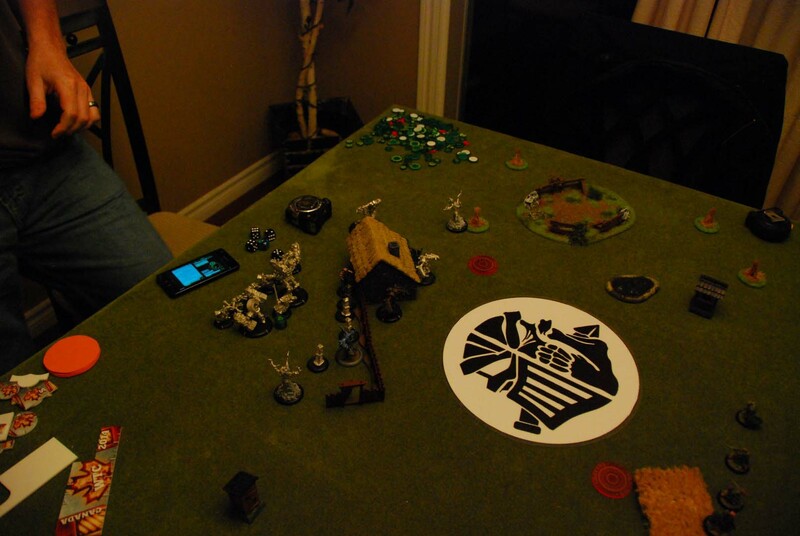 Eiryss moves up behind Outhouse on left, kills closest Druid. 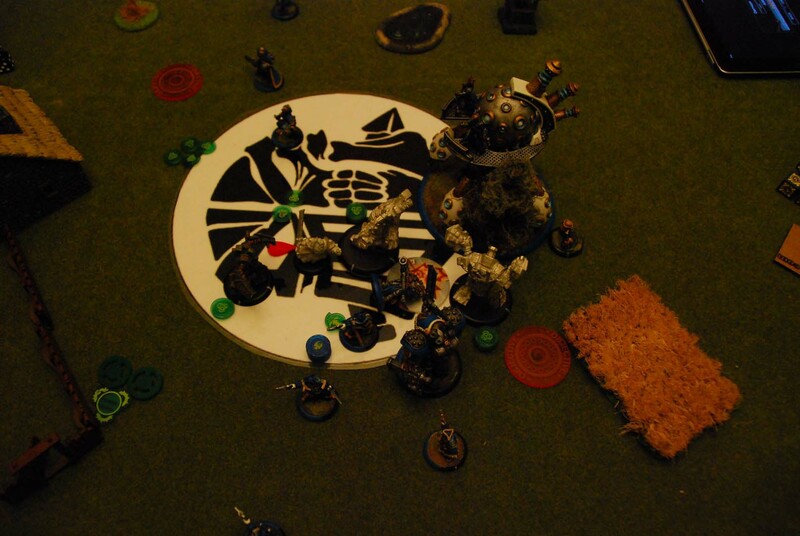 Todd pulls in all the Fury, takes another point of damage from his Wyrm token, heals one from his bond to Megalith. 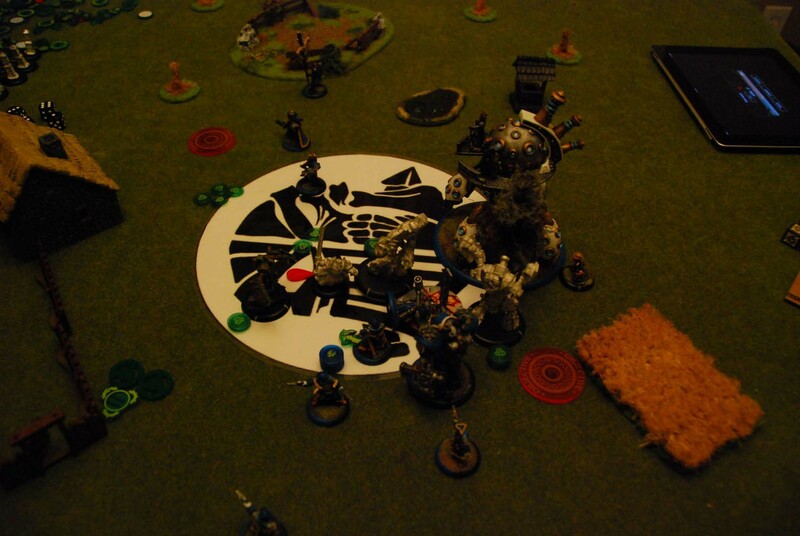 Megalith moves up, casts “Crevace” at a Ranger, misses. Guardian moves up. Uses Clay-skin-thing. 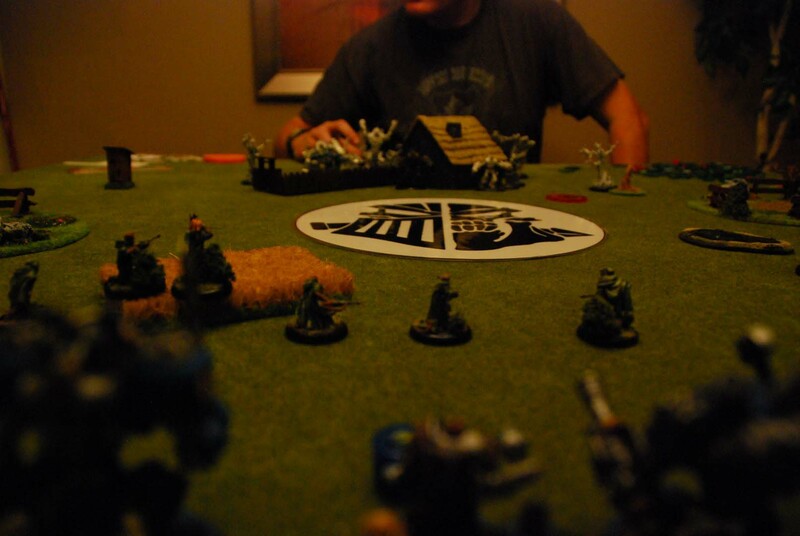 Druids activate and fire shots at my ATGM. Manage to hit and kill 2 of them. Use Antimagic again. 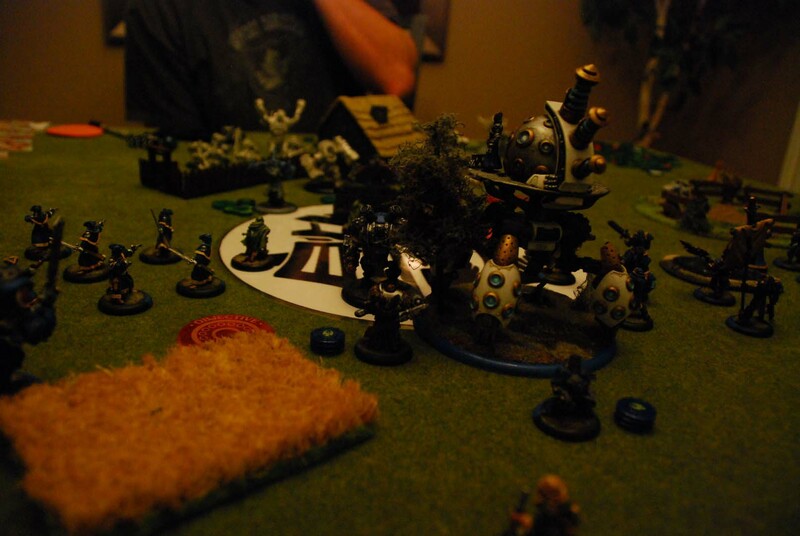 Baldur activates, moves up, pops Feat. Casts Clay-skin-thing on himself. Gallows Grove is stuck due to Feat. Nothing to upkeep: 1 Focus to Defender. Forget about Squire again. 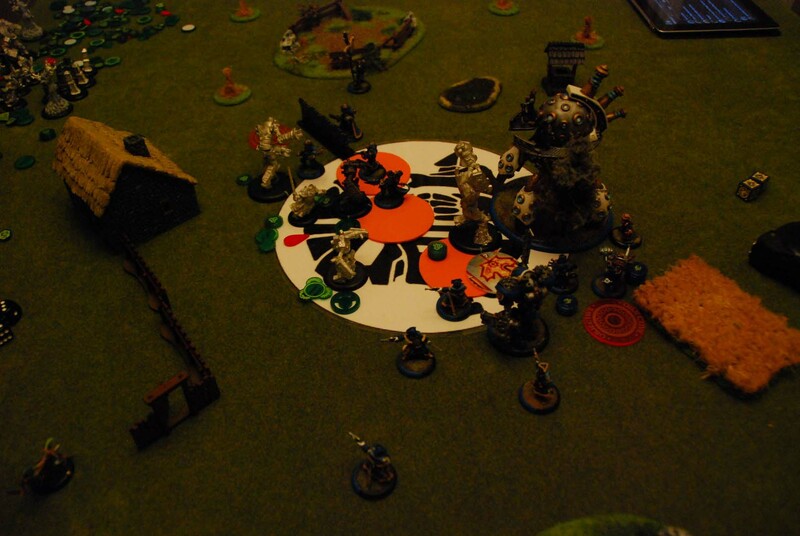 Strider takes shot at Megalith: hits, inflicts light damage, arcs to Baldur but (at ARM20) does nothing. 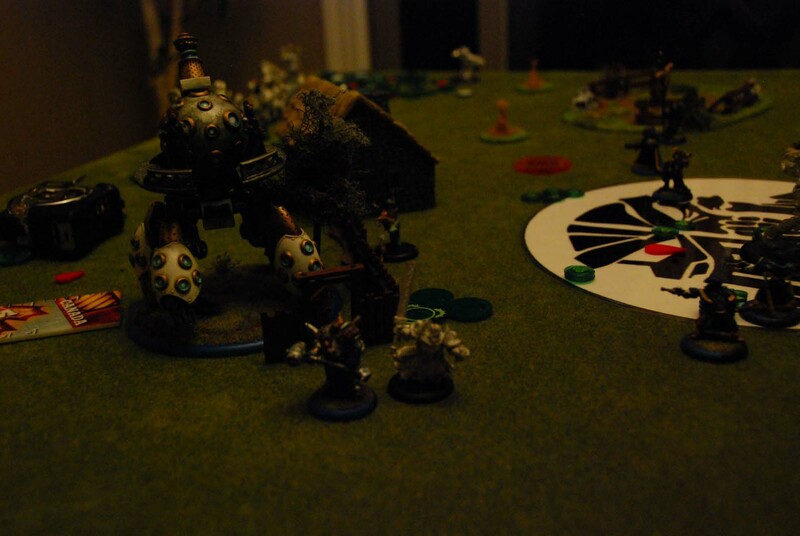 Second shot at Megalith: light damage. Defender stands and aims at Guardian: hits, boost damage (back up to 2d6) and inflicts light damage. 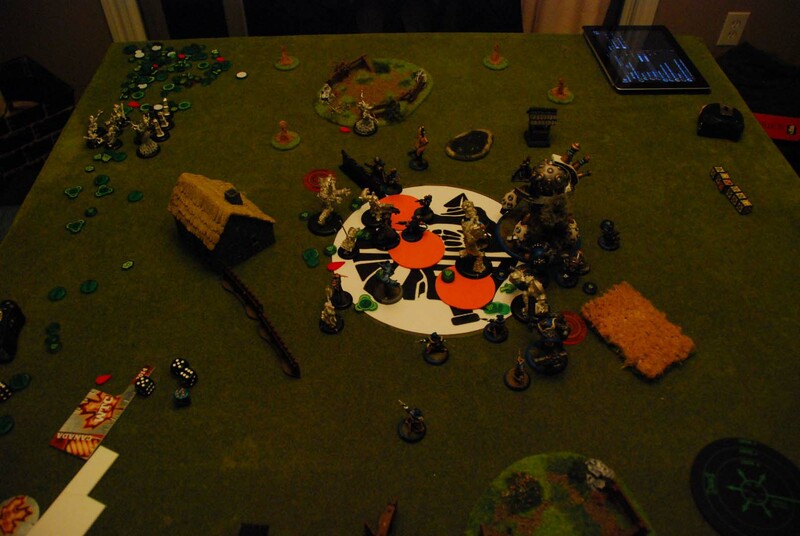 ATGM move up and spread out: open fire on Druids, killing all but 2. Eiryss activates, kills another Druid. 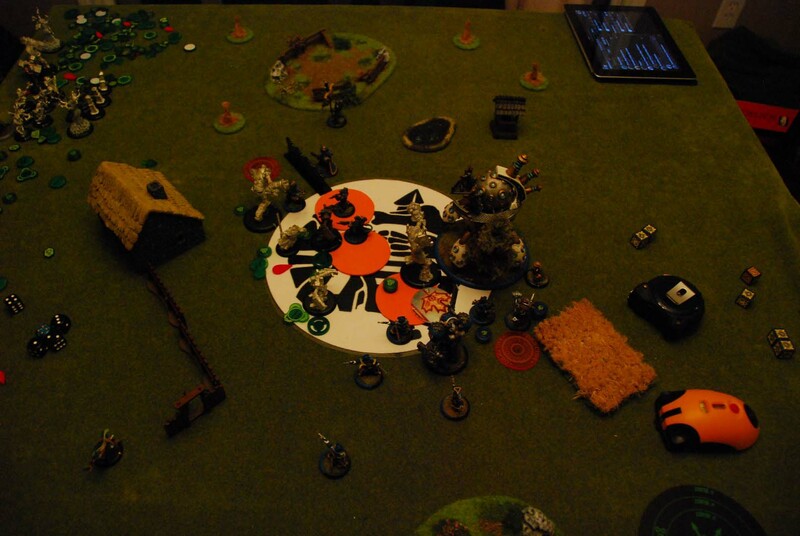 Avenger activates, fires at Woldwatcher: misses, scatters harmlessly. 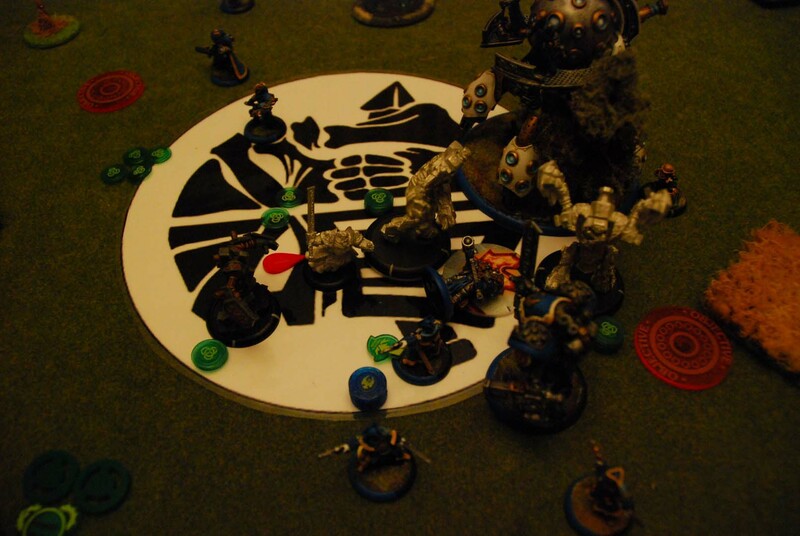 Siege activates, uses “Ground Pounder” again: spends a bunch of Focus boosting damage on the Woldwatchers, hurts a couple for a few points of damage (dice-12). Waste 2nd shot: nothing in LoS. Stormblades activate and charge. They all get their Assault shots: ping a few Woldwatchers for some light damage, hit the Gallows Grove for 3 points, hit the Woldwarden for light damage, 2 successful charge attacks hammer 2 different Watchers, crippling Mind on one of them (and leaving in on 2 boxes). 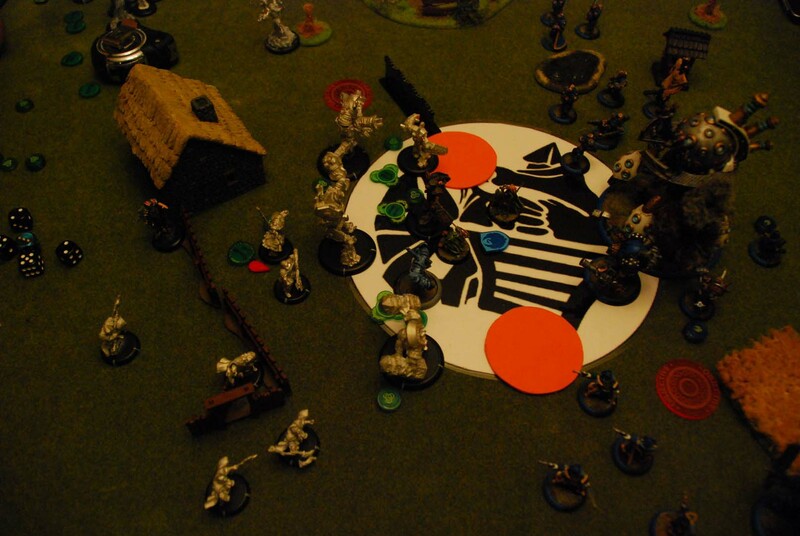 Sadly, 1 AoE from an Assault shot clips a Ranger, killing him and forcing another CMD-check, which the last Ranger fails. 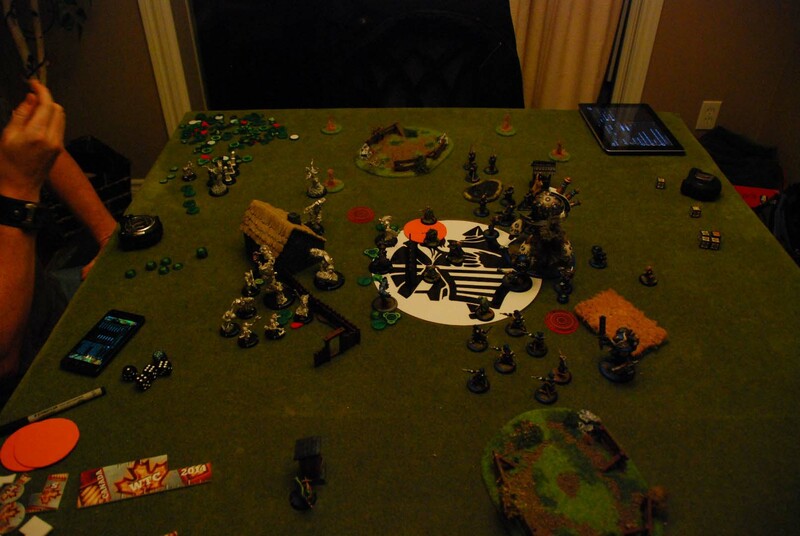 Baldur was camping 2 Fury, so can’t pull back in everything: about 3 Fury stays on the table. 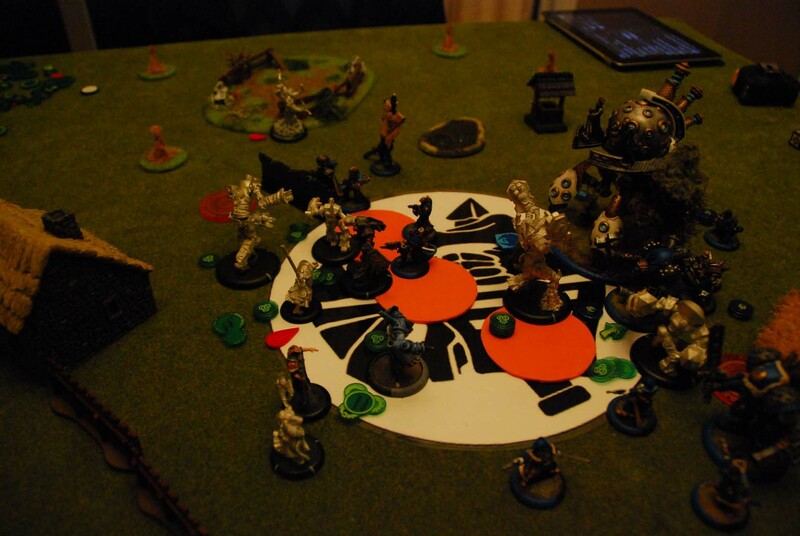 Watchers start, moving around and killing a couple Stormblades. 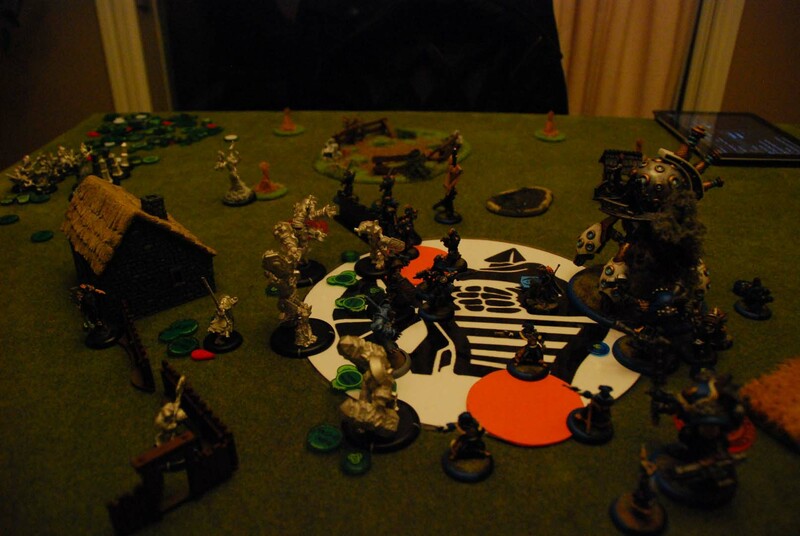 Wold Guardian charges Defender, hits and knocks it down, but can’t get between Defender and Objective to get to Siege. Hits Objective a few times, leaving it on 5 boxes. Last Druid shoots at ATGM Officer: misses. 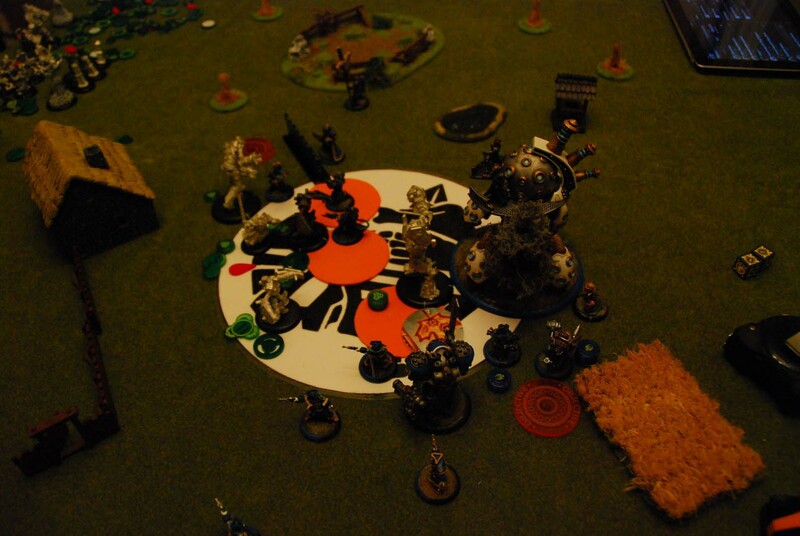 Baldur moves forward, casts Clay-skin-thing again. Siege camps full stack. Again, forget the Squire. Because why would I possibly need another Focus? Defender goes first, moves out of Siege’s way: takes a free strike that scraps it. 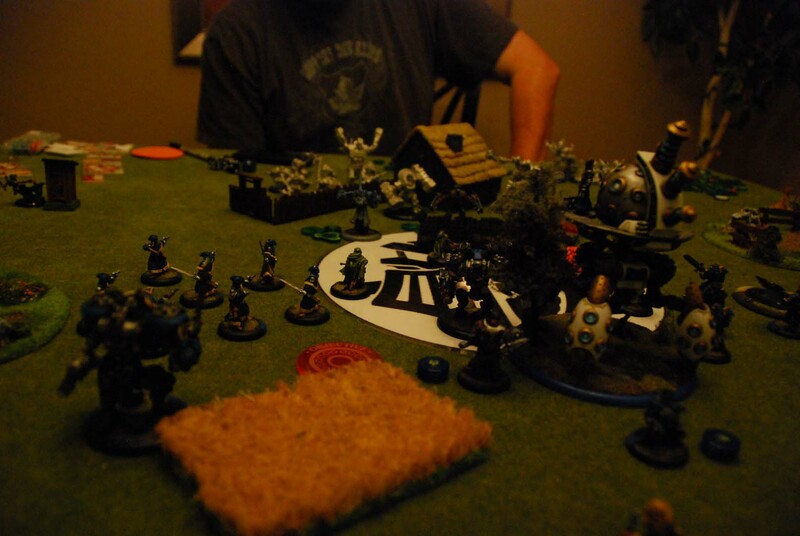 Avenger activates, walks behind Wold Guardian: hits it twice (with Marshalling bonus), inflicts moderate damage. Siege activates, moves up to Wold Guardian, scraps it after spending 2 Focus. Camps remainder. Strider walks to try and block access to Siege: can’t. 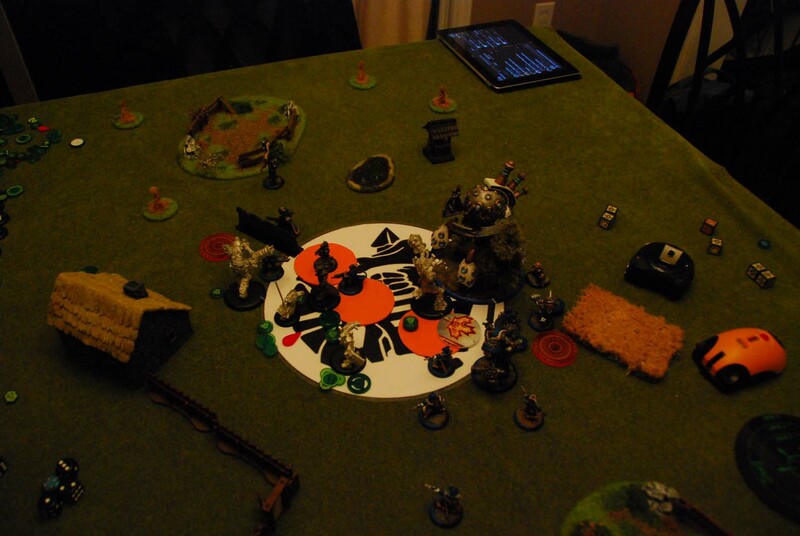 Opens fire on Megalith: hits, inflicts light damage, electroleap fries last Ranger (whoops). Second shot also hits, inflicts light damage. Nothing crippled. 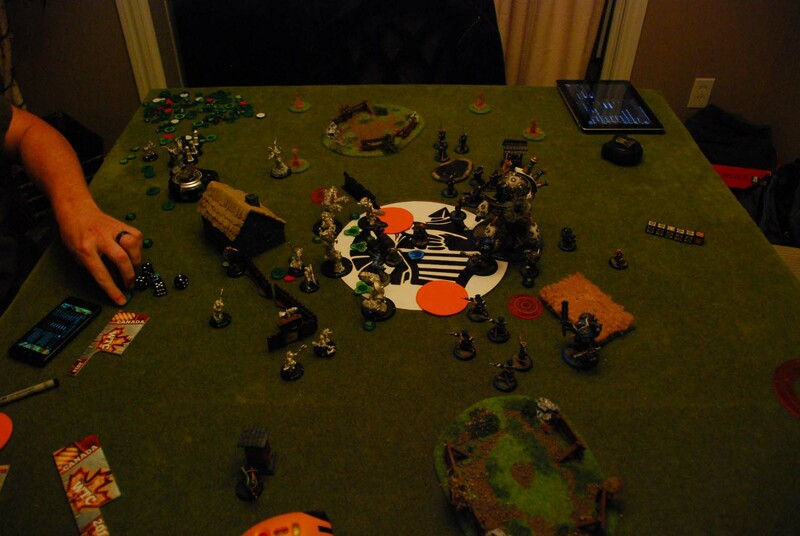 Stormblades walk forward: they kill 2 Woldwatchers (FINALLY) and put some hurt on the Woldwarden. 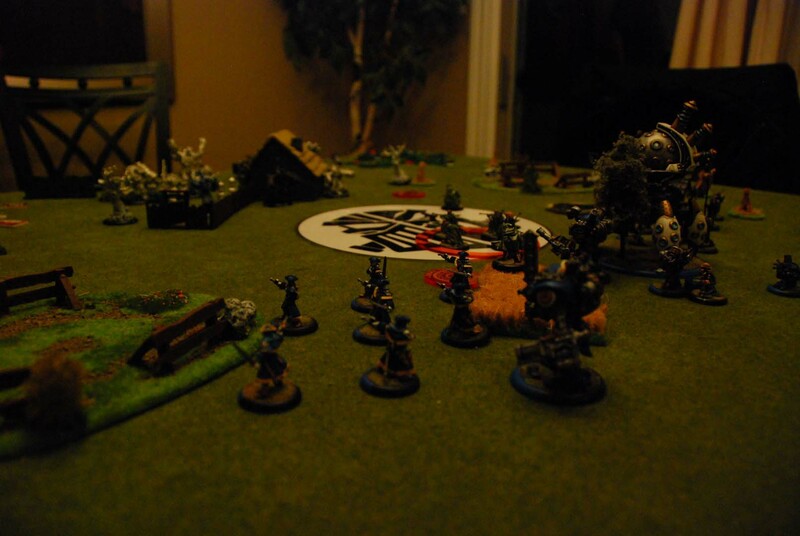 One shoots at Baldur but misses. 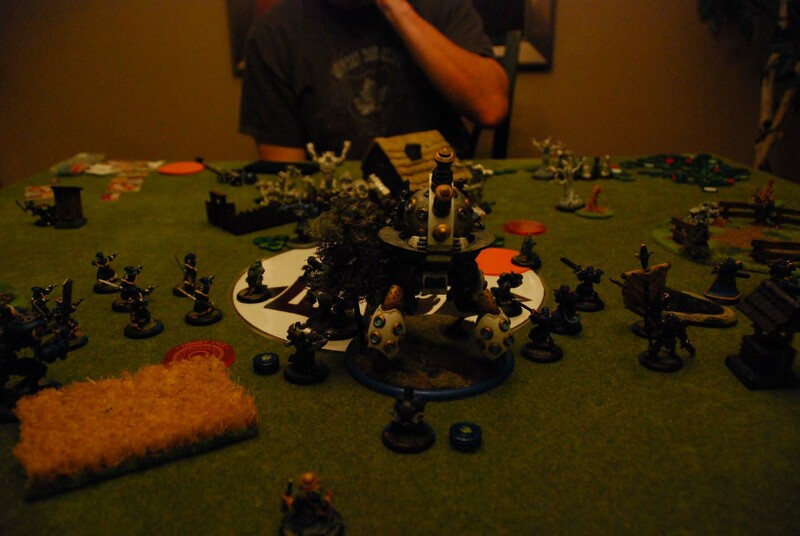 Eiryss shoots Baldur in the back: Todd elects to Shield Guard that shot to a Watcher, who takes 3 damage as a result. Todd decides to end this. 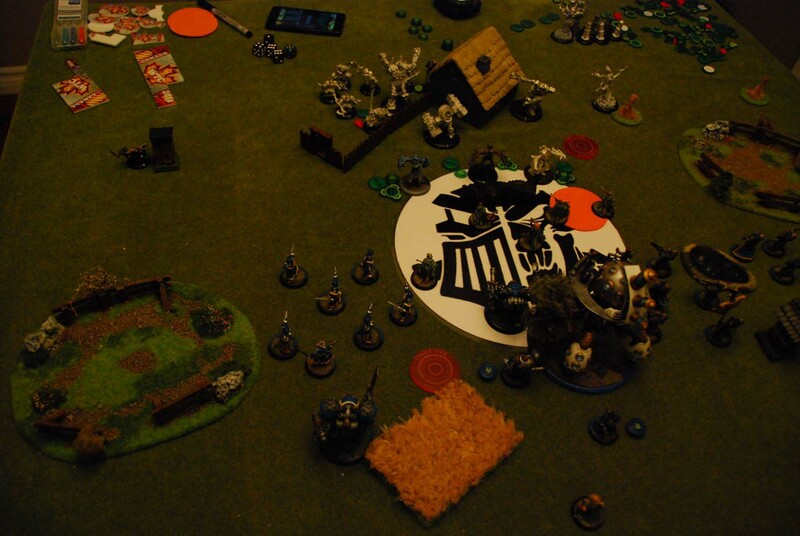 Baldur pulls back to full Fury, takes a few more points of damage from Wyrm Tokens and heals for 1 from Megalith. 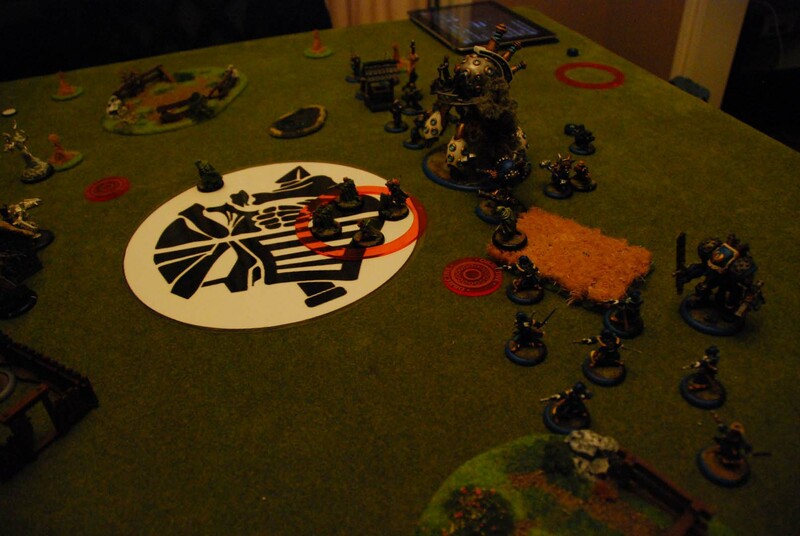 Megalith goes first, walks over to Siege and 2-hand-Throws him. Boosts to hit, hits, and has no problem overpowering Siege. He throws him at Baldur, well out of range, but Siege is still thrown towards Todd’s army (and scatters slightly closer). 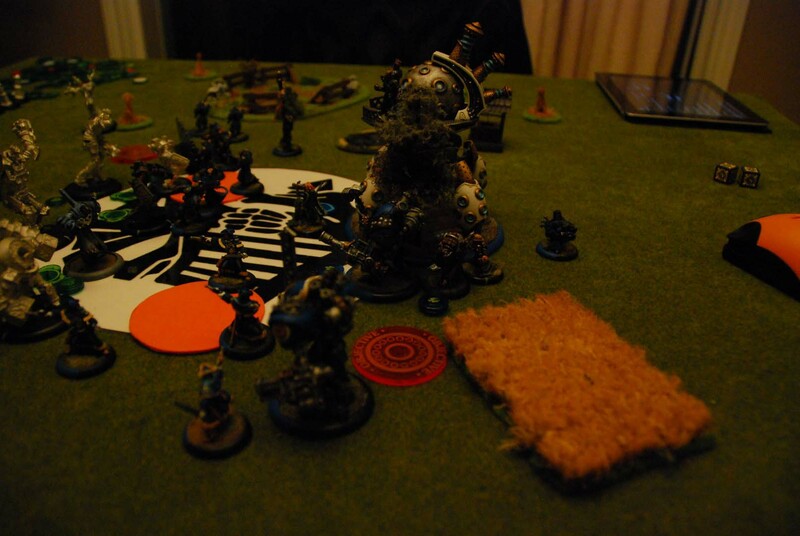 The Woldwarden tramples over some Stormblades (killing 1) and gets up to Siege. 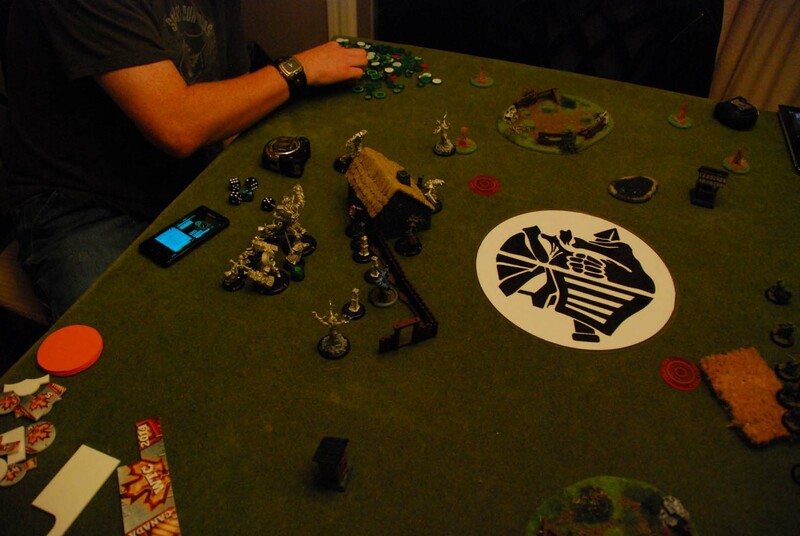 He buys a few attacks, putting a couple points of damage on my warcaster (who is camping 4, and therefore at ARM21). 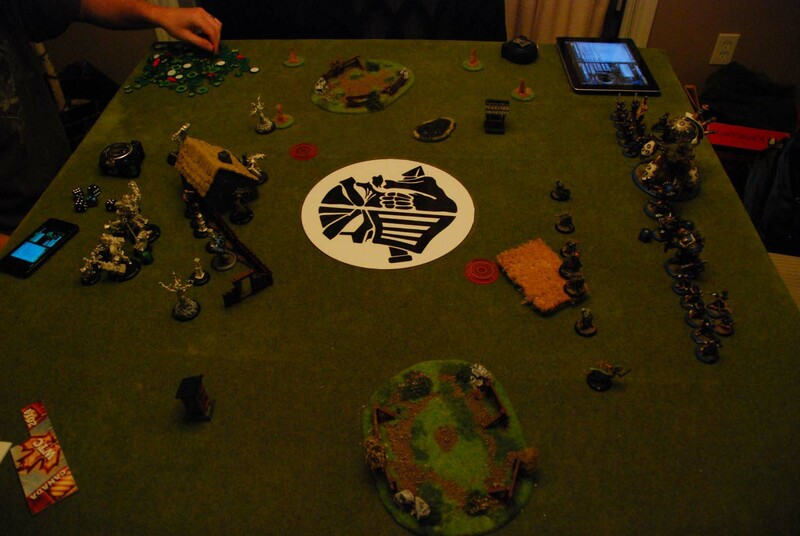 Baldur charges in at POW18 (from Wyrm tokens). Initial attack hits and inflicts a few points. Buys and boosts damage: inflicts 7, leaving Siege on 3 boxes. Buys another and boosts damage: drops Siege. Not an awful game… I’m not 100% sure I picked the right moment to pop Siege’s Feat. Might’ve been better to wait until I could get Stormblade charges off. Also: picking pEiryss over eEiryss for this list was a mistake. She’s seriously hamstrung against Hordes… eEiryss would’ve been pinging off Animi and upkeeps all game, while pEiryss only managed to kill a couple Druids and put a few points of damage on a Watcher. Additionally, bad list construction overall… the Avenger is nice (especially with Snipe from the ATGM Officer’s Rune Shot), but I think my original plan of a Charger on Jakes would’ve been much, much better in this list (otherwise, she should have a Hunter, I think… maybe 2). A couple fully boosted POW12s on Feat turn are unquestionably useful. Todd played a solid game, went for the kill when he had the opportunity, didn’t let the early setback of losing ALL his Shifting Stones on Turn 2 stumble his plans. A solid game, and great fun. 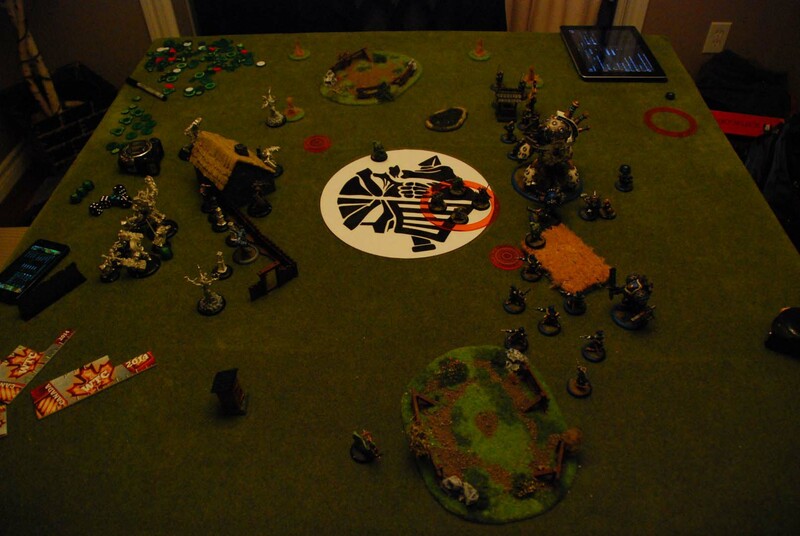 This entry was posted in Baldur, Battle Reports, Circle, Cygnar, Podcasts, Siege and tagged Brisbane, eBaldur, Hordes, IABN, Oroboros, Storm Strider, Turns out that I'm not very good at making Siege lists, WarMachine by Marx. Bookmark the permalink. If this were a WH40K game, I would claim that this is the “grim dark” future of dark grimminess. As it is… just bad lighting. Or, more accurately, fine lighting with a complete moron behind the camera!